My kids love being involved in any part of Christmas decorating. And it's sometimes tough for me to let the kids be involved because I'm such a perfectionist, but this is a great project for them and it was so fun. 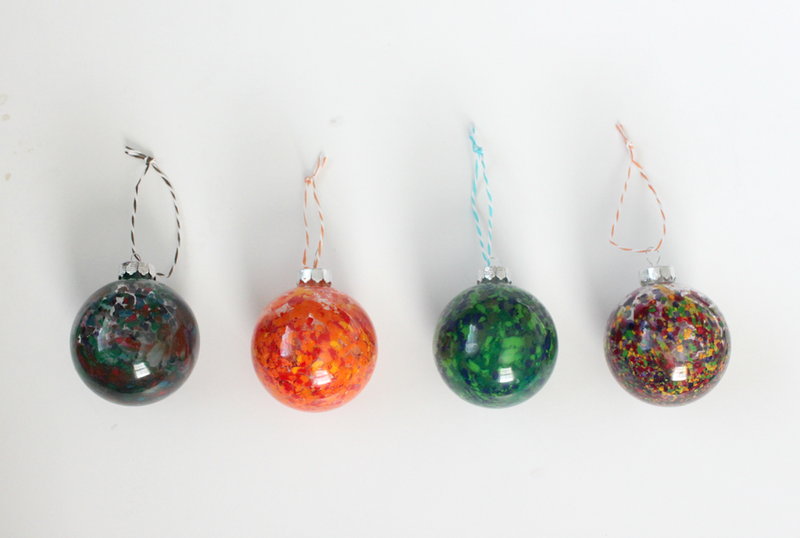 I used some clear glass bulbs leftover from ornaments I made a few years ago. All you do is gather up some broken Crayola crayons-never a hard task with little kids around. I let the kids each pick out the colors they wanted to use and had them take off the paper wrapper on each crayon. Then we broke them in to littler bits (you need about 2-3 crayons total but it can be pieces of lots of crayons). Then put the pieces in a ziplock bag and use your weapon of choice-a rolling pin, meat pounder, etc. Hammer the crayons in to tiny little bits. Then carefully pour the little bits into the bulb. Use a hair dryer on high heat, and hold it about an inch away from the outside of the bulb and start melting the crayons. Yes, your fingers will get really hot so be careful! I let the kids pick the crayons and smash the crayons, but this part was way to hot for them to be involved. You will find that you just need to hold the hairdryer on one spot for a few seconds and the crayons will start to melt. So then shake it around, and point the hairdryer on a different area of the bulb. And that's it! 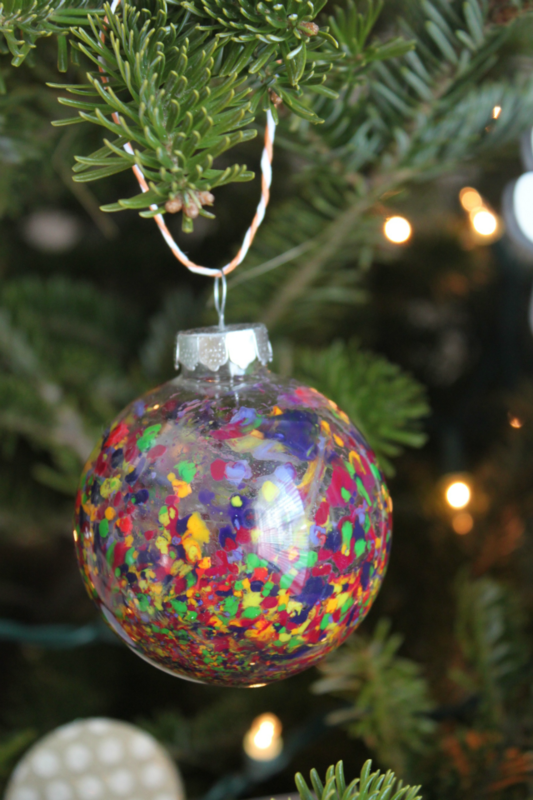 I loved doing this craft with the kids. 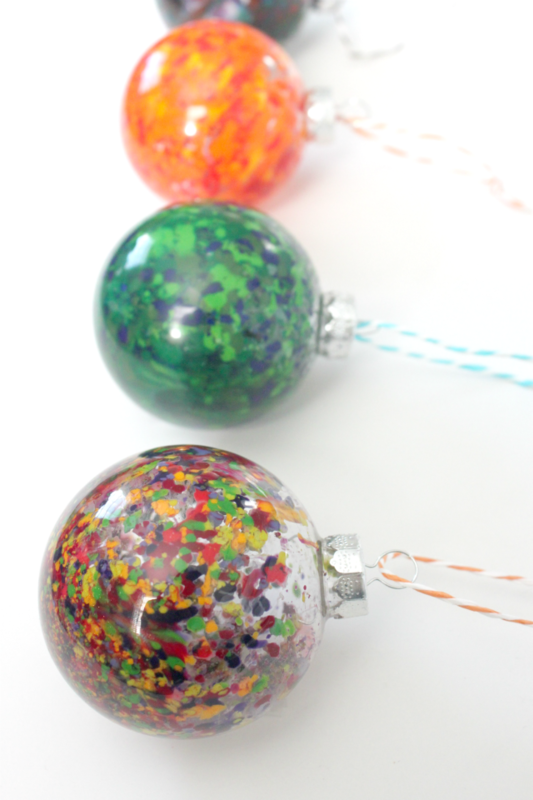 And now every year we pull out these ornaments, they will be excited that they helped to make them.